How Do Affiliate Marketing Programs Work? The whole concept of affiliate marketing programs is often a mystery to a newcomer. How does it work? Why is it necessary? Is it worth the time? Affiliate marketing rarely gets the respect and attention it deserves. This is partly because many marketers believe it’s synonymous with referral marketing. Something they are already doing. But the two terms are not interchangeable. Once you learn how affiliate marketing programs work, these differences become clearer. This blog post will give you an overview of the mysterious inner workings of affiliate marketing. So you can decide if it might be right for your business. First things first: affiliate marketing is the practice of having other people (affiliates) promote your products in exchange for a commission if their promotion results in a sale. Affiliates can promote your products via their own website, blog, or social media channels. When someone clicks on their affiliate link and makes a purchase on your website, you give them a percentage of the sale. Affiliate marketing also gets referred to as passive income. Meaning there’s not much hands-on required once you begin your affiliate marketing programs. This is one of the elements that make affiliate marketing one of your biggest ROI powerhouses in your entire strategy. There are a lot of moving parts to affiliate marketing programs. Some of which are likely more technical than you need to know to make your program successful. But for education’s sake, this article includes a little deep-dive knowledge to help it all make sense. Let’s use Amazon as an example, as they arguably have one of the best affiliate programs in existence. You can register to become an affiliate marketer with Amazon by clicking a link and signing up. It’s absolutely free to join. Once you register, Amazon will email you your assigned affiliate ID. This ID is how Amazon knows who made the referring sale. Once you have an ID, you can choose products from Amazon’s website to promote on your social media channels or website. For example, if you wanted to promote a particular book, you might write a book review post on your blog and include a link to where readers can purchase the book on Amazon. The link you include to the book will also contain your unique affiliate ID so that Amazon will credit you with any sales resulting from people reading your book review. Once a user clicks the link and makes a purchase, you will be credited with a percentage of the sale, which they call Advertising Fees (Amazon currently pays up to 10%). The best part about affiliate marketing is that payments are performance-based. You’re not wasting valuable advertising dollars on the wrong audience or hiring an inefficient marketing agency. You pay only for real customers who make real purchases, not engagement that never results in conversions. On the affiliate marketer’s side, there isn’t much technical knowledge required since Amazon provides everything they need. Marketers can use Amazon’s linking tools and copy and paste their ID to earn their commissions without much effort. They’ve got the advantage of highly skilled developers and a budget to match to create a sophisticated, automated program that does all the hard work for them while they enjoy a boost in sales. The good news is you don’t have to be Amazon to have a solid affiliate marketing program, nor do you need your own personal army of developers. Affiliate marketing software gives you a turnkey program that gives you and your affiliates a seamless, near-effortless experience. You can promote your program on your own channels, or take advantage of your software provider’s established network. In Amazon’s case, potential buyers click the affiliate’s link and get directed to the website. Your software will document the visitor’s session ID, which is a fancy term for a number assigned to each unique visitor that enters your site. If a visitor from an affiliate link makes a purchase, your software will credit their account and handle the payout. There’s one other technical consideration when working with affiliate marketing programs, and that’s determining how to handle visitors that click an affiliate link, don’t make a purchase, but later revisit your website and complete the transaction. Amazon’s one-day cookie means a potential buyer has one day to make a purchase in order for the affiliate to receive credit (there’s an exception to this rule). On the other hand, Target offers a generous seven-day window, while other brands may offer more or less. It’s a choice you’ll have to make yourself. The biggest reason affiliate marketing programs work is because they provide a win-win for both the business and the affiliate. The company benefits from only having to pay advertising fees on actual sales. Another benefit many companies don’t consider is the boost in SEO by earning backlinks and more website traffic. It’s also your chance not only to earn sales but also to earn more loyal customers after the sale. Of course, the affiliate benefits too by receiving advertising fees in exchange for their promotion. This gives affiliates a chance to monetize their blog without the hassle of setting up credit card portals, paying for ads, or shipping products. There’s minimal effort involved, and the return can be quite rewarding. 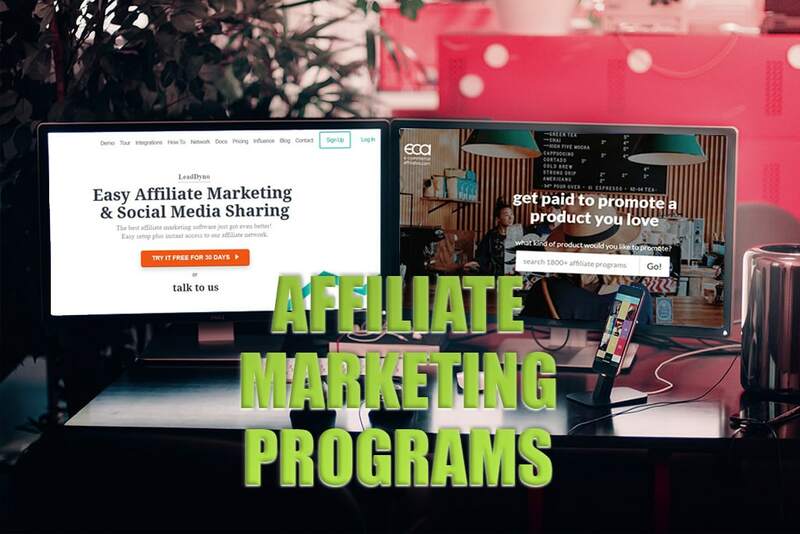 If you want more proof that affiliate marketing works, look no further than some of the best affiliate programs on the internet. Target, eBay, Jet, and Walmart all offer handsome rewards for directing online sales, with Target’s potential rate topping off at a whopping 8% for apparel items. Top paying affiliate programs often run a tiered system. Which means your rate will depend on categories (baby, shoes, household, etc) and the number of sales achieved in a given time period. Now that you understand how affiliate marketing programs work, how will it fit with your business? Partnering with the right affiliate software provider can make all the difference in your program’s success. Take a free test drive of LeadDyno’s affiliate marketing software and discover how easy it is to build a better business.